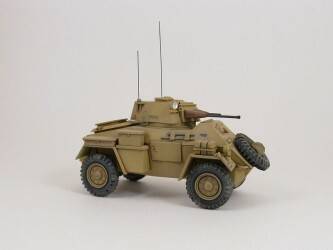 This Humber Mk.II is an old release of this vehicle by Hasegawa, probably molded in the 1970-1980 time frame. 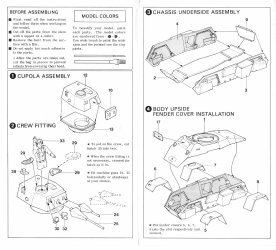 Inside the box you get a svelte count of 40 nicely molded parts in Hasegawa's excellent hard plastic. There are two short lengths of copper wire for the axles, a small decal sheet and an instruction sheet. Molded detail is very crisp. Flash was minimal, the only parts having any being the two tool boxes (parts 26 & 27). There were no sink marks of note except on back side of the wheels. Their position made them too difficlut to fill so they were left as is. You can't really see them once they're mounted on the axles anyway. 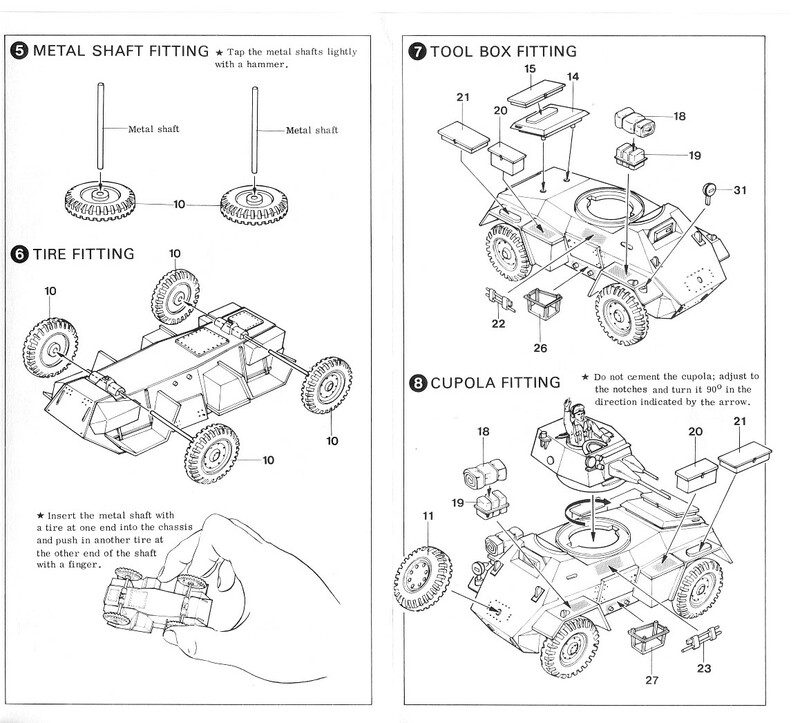 The instructions are well laid out, easy to follow with no vagueness as to where parts are to be placed. 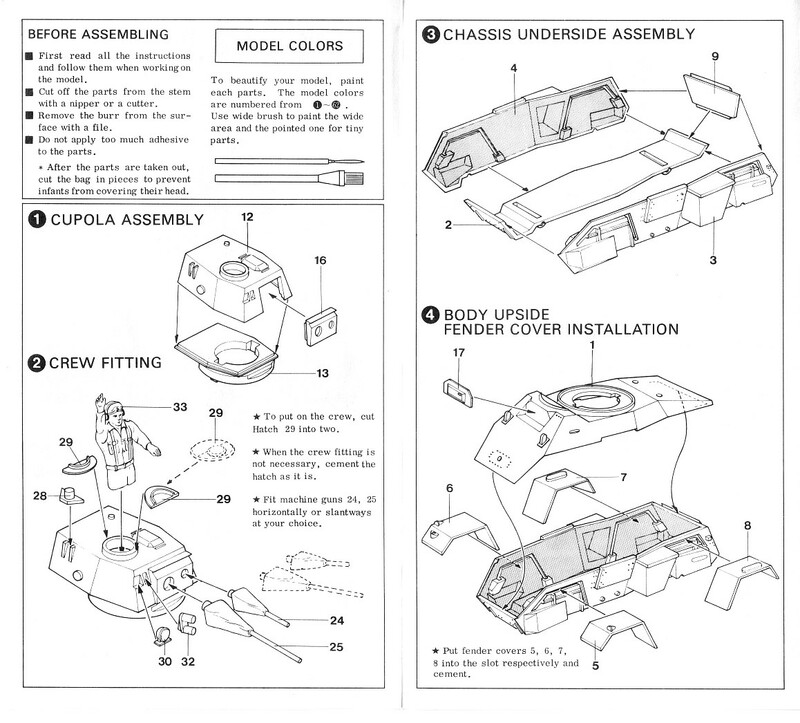 One nice feature of the instructions is the naming of each part. 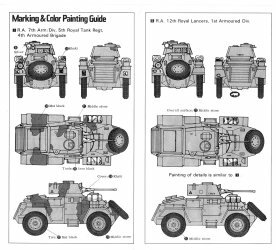 I have always found naming the parts great because it also provided additional information about the vehicle and gave you a bit of an education along the way. 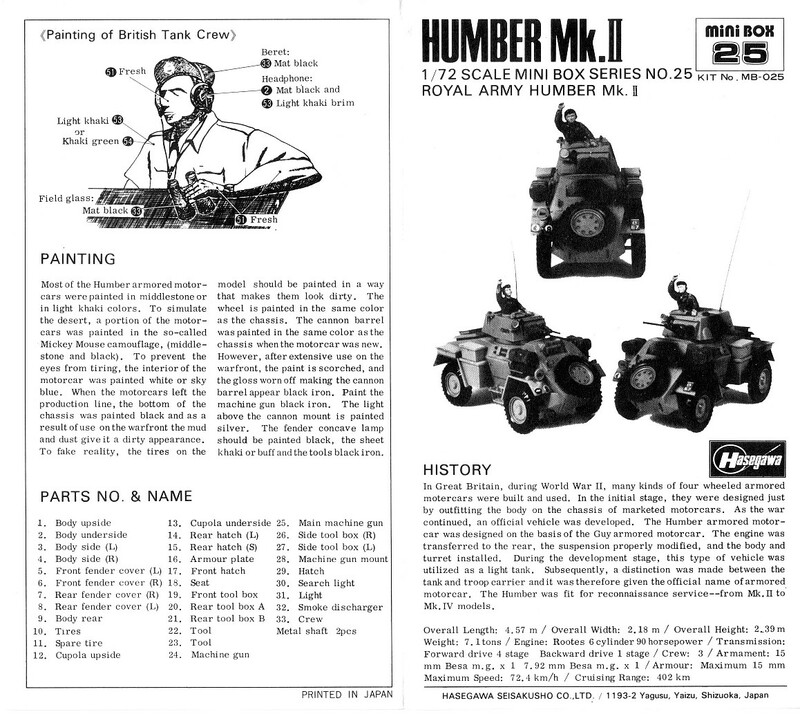 The kit's two tarps are poorly molded with next to no detail or relief so they were assigned to the parts box and a replacement was fashioned from two part Tamiya epoxy with the addition of lead foil straps. I added lift rings to front and rear, handles to the engine cover and tow hooks to the front and rear. A scratch built shovel was attached to the left upper hull (an item that is sadly lacking and really should be included). The wheels are nicely detailed. Tire tread is very well done and as far as I can tell quite accurate. The search light was detailed with a chrome sequin for the reflector and 1-minute epoxy to represent the clear glass lens. I tried something new for the small lights on the fenders. These were drilled out, filled with gloss white paint and then filled with 1-minute epoxy to represent a clear lense. I think the end result shows enough promise to try this again on future builds. The main gun barrel and the smoke dischargers were drilled out. 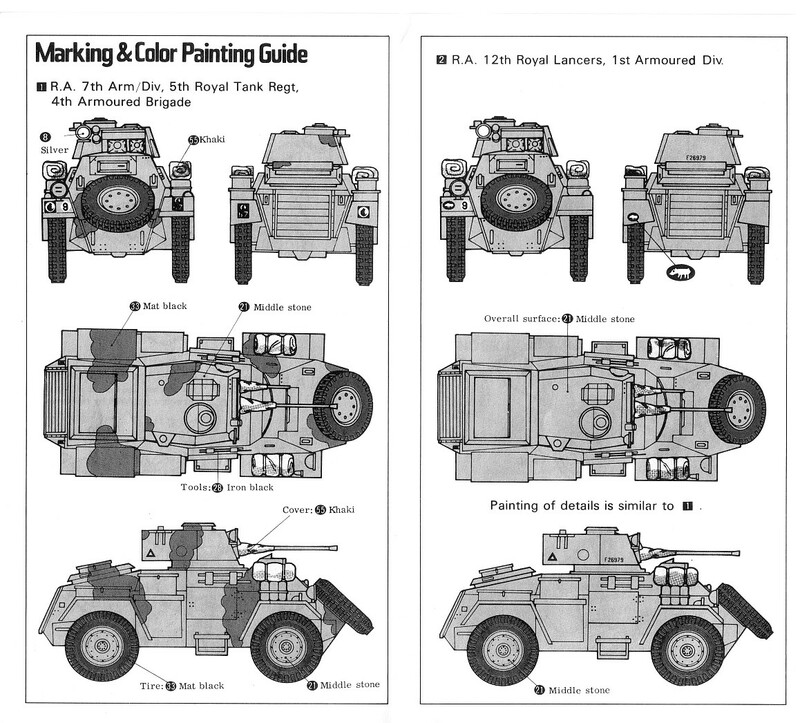 The cannon and machine gun can be glued in either of two positions: horizontal, or slightly elevated. The commander's hatch can also be molded shut, as I did, or cut in half to allow the figure to be inserted. Sections of guitar wire supplied the antennae. There is no suspension of any sort. 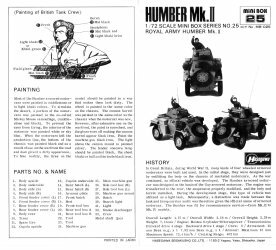 Most of what I built was by guess and by golly because I couldn't find any clear photographs, only partial views of the Humber suspension. The few shots I did find show that the Humber definitely used a leaf spring suspension with a strut on the front. There are some exposed stearing components like tie rod ends and possibly an anti-sway bar on the front suspension but without a clear view of these I just settled for some springs attached to the axles along with the front strut. The leaf springs were liberated from a Hasegawa Jeep (got the Jeep for only a dollar at the local club's monthly raffle) and I added struts to the front from sections of plastic rod. 7th Armoured Div., 5th Royal Tank Rgt., 4th Armoured Brigade, in overall sand/tan camouflage with a black disruptive pattern. 12th Royal Lancers, 1st Armoured Div., vehicle number black F26979, in overall sand/tan camouflage. 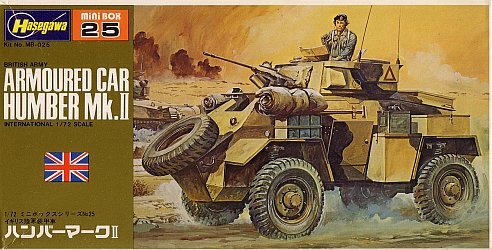 No time frame is mentioned for either option but I suspect both are circa 1942, Battle of El Alamein. 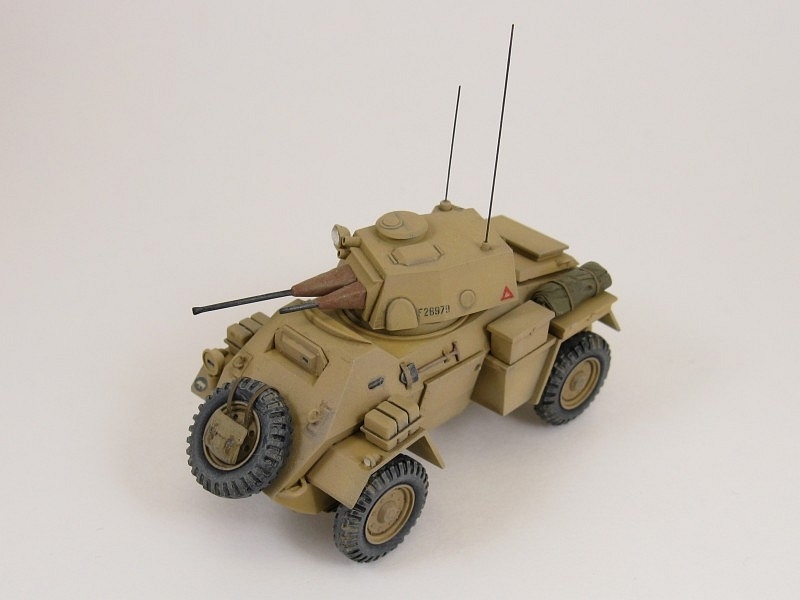 There are a few images that are not used which look to be be intended for the Hasegawa Daimler Armoured Car because the backside of the decal sheet has both kit names printed on it. 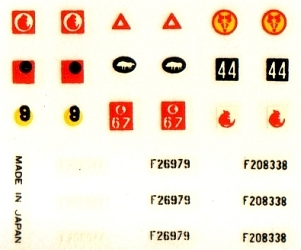 Decals were old and quite thick as per usual with Hasegawa. They were out of register but not enough to make a difference with the option I chose (vehicle number F26979) except for the unit triangles and the yellow bridge class disc. The disc was replaced with a spare from the Italeri M-8 Greyhound sheet and I had to trim the red triangles right up to their edge to remove a thin white outline due to the register problems. A few liberal applications of Microsol got all the decals to sit down nicely. 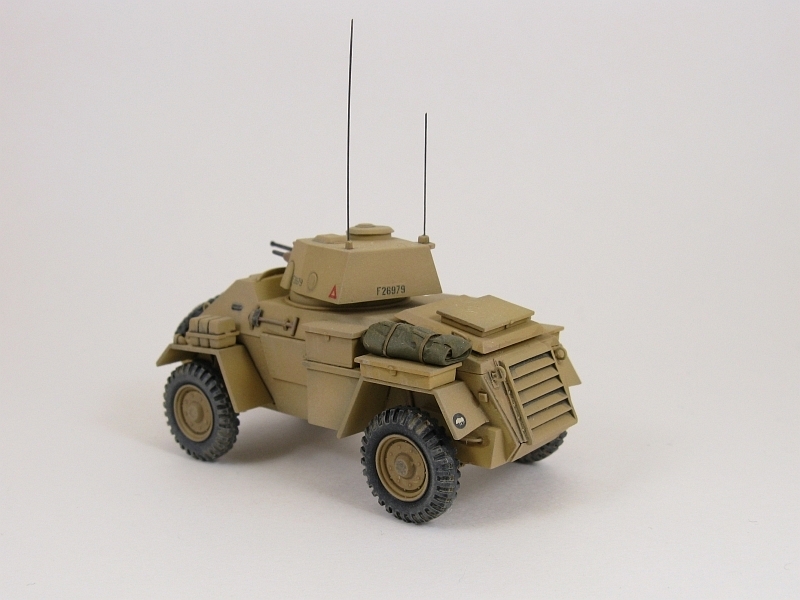 All in all and easy, quick and pleasurable build, one that all skill levels will enjoy. 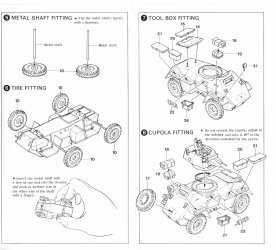 The perfect fit to the parts and the low part count makes this kit a breeze to build, yet there is enough room for those who like to do some extra detailing.